In the 20 years since we published our first guide to citing historical records,1 we’ve learned something well: If one person is confused about something and musters the courage to ask, there are thousands more who won’t ask. So, instead of answering our perplexed friend privately, we’re doing a public tutorial here. We aren’t just citing an image. Yes, that’s the main thing we’re interested in, but we actually have multiple things to cite. Providers deliver their data in different ways. That affects how records have to be identified. Even the same provider will organize different collections in different ways. Those differences can change how we have to identify the collections—both our formats and our wording. When you cite an online image copy of an original record book or original file—whether it's provided by FamilySearch, Ancestry, or any other entity that did not create the original record—you have at least two different things to identify. Each is a separate part of the same “citation sentence.” We refer to each part as a “layer" within the citation, and each layer is separated by a semicolon. In Layer 1, you cite the original that you are eyeballing as a digital image. You cite it the same way you would if you were using the original or microfilm of the original. How to cite the providers in Layer 2—the website, its database, and the exact location of the image of interest—is the purpose of this tutorial. Websites, being a "standalone" publication, are cited like a book. A database at a website is cited like a chapter in a book. 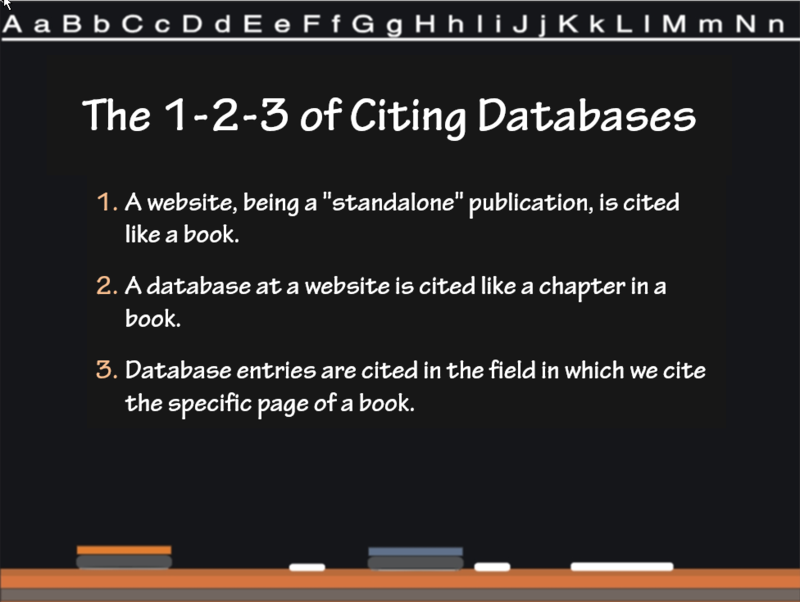 Database entries are cited in the field in which we cite the specific page of a book. “Name of Database in Quotation Marks,” type of database material, Title of Website in Italics (URL=Place of Publication : date of publication or access), exact item of interest. “World War I Draft Registration Cards, 1917–1918,” database with images, Ancestry (http://www.ancestry.com : accessed 1 January 2017), database entry for Clovis Julian, born 26 July 1887, New Orleans. “World War I Draft Registration Cards, 1917–1918,” database with images, Ancestry (http://www.ancestry.com : accessed 1 January 2017), imaged card for Clovis Julian, no. 120, New Orleans Draft Board 13. However, things are changing—especially with the mega-providers. You can see actually the terms "arc" and "pal" in the URL; so you know you are dealing with a persistent identifier that (a) will take you directly to the page of interest; and (b) optimistically will not develop link-rot. People make typos. Even when cutting-and-pasting, we often lose a digit or add one—thereby making a URL unworkable. In addition to citing the exact URL—a non-intuitive jumble of numbers and letters—we may also need to add information about the database’s organizational scheme so that (a) we can relocate the image when either A or B happens; and (b) we can better understand the type of record we're working with. When we add the data that Point 3 calls for, we describe this as adding a “path” with “waypoints” to lead us to the image of the exact record we have cited in Layer 1. Sometimes the path is very short. Let's take the the Oklahoma example, above, and place the path and its waypoints in their appropriate position—the last field of the citation, where we normally put our "item of interest." Oklahoma County Marriage Records,” database with images, FamilySearch (https://familysearch.org/ark:/61903/3:1:9Q97-Y3Q7-Z6Y?owc=waypoints&cc=1709399 : accessed 1 January 1017) > 1313685 (004532716) > image 479 of 711. 1313685 (004532716), which identifies the roll of Family History Library (FHL) film that FamilySearch has imaged and (in parentheses) the new digitization project number. Image 479 of 711, which tells us where on that roll of film we can find the image of the record we will have cited in Layer 1. Many collections digitized online at FamilySearch (and now Ancestry, as well) are organized in a more complex fashion that creates numerous waypoints to cite, each of them nested inside of others. EE 7.18 (3d. ed. rev., 2017) shows us how to cite a set of registers from a church in St. Libory, Illinois. …; accessed as “Illinois, Diocese of Belleville, Catholic Parish Records, 1729–1956,” browsable images, FamilySearch (https://familysearch.org/search/collection/1388122 : 1 April 2015), path: St. Clair County > St. Libory > St. Liborious > 1849–1862 Baptisms, First Communion, Confirmations > image 33 of 68. The boldface used above reflects two alterations from the format in the Oklahoma example. The type of database has changed. It's no longer "database with images." Now it's "browsable images." This term is used for a set of records with no indexing and no neatly typed abstract or extract of the record. We have to browse the images to find what we need. The URL pattern has changed. This is not an ARK or PAL citation. Because we are browsing a collection, instead of going straight to the image we want, the URL leads to the landing page for that collection. At FamilySearch, when we select a collection and go to its landing page, the URL typically includes the word "collection" followed by a slash and a collection number. We use this URL, optimistically assuming that the collection number will never change. St. Liborious Church (St. Libory, Illinois), “Liber Baptismalis ab anno 1849 die 30 Murt. Usque ad initium anni 1863,” unnumbered pages, unnumbered entries in chronological order, “Elisabetham Aberle,” baptism, 12 November 1857; accessed as “Illinois, Diocese of Belleville, Catholic Parish Records, 1729–1956,” browsable images, FamilySearch (https://familysearch.org/search/collection/1388122 : 1 April 2015), path: St. Clair County > St. Libory > St. Liborious > 1849–1862 Baptisms, First Communion, Confirmations > image 33 of 68. All information that identifies the original record appears in Layer 1. All information that identifies the website and its database appears in Layer 2. Never, ever, should details from one layer be mixed into the other layer. For example, the original volume has pages. It does not have image numbers. Image numbers are a unit of the image database. That image number should not appear in the part of the citation in which we identify the original register. Nor should our discussion of pages (something we do find in original registers) appear in Layer 2 where we are discussing elements of the database. …; imaged in “California Passenger and Crew Lists, 1882–1959,” database with images, Ancestry (http://www.ancestry.com : accessed 1 January 2017) > M1416 – San Francisco, 1905–1954 > 012 > image 656 of 1016. “Alien Crew List,” S.S. Arrino (Lota, Chile, to San Francisco), arriving 7 October 1913, p. 11, C. S. Dendy; imaged in “California Passenger and Crew Lists, 1882–1959,” database with images, Ancestry (http://www.ancestry.com : accessed 1 January 2017) > M1416 – San Francisco, 1905–1954 > 012 > image 656 of 1016. In the twenty years since we published our first guide to citing historical resources, technology has made it so much easier to access the records that are our lifeblood. At the same time, it has also complicated the one part of research that makes most people cringe: citation. Source identification is now more complicated. What was once just tedious is now often baffling. Yet, the very fact that historical records are being processed in so many different ways—ways that can change their content, their legibility, and their dependability—makes it all the more critical that our citations identify precisely what we have used. The old concept that "We cite sources so others know where we found our stuff" isn't good enough for reliable researchers. We know that the real reason for investing this effort is to ensure that we use the most reliable sources possible. We accomplish that by carefully studying what it is we are using and recording enough details that we can accurately evaluate reliability any time we have conflicting information. The tedium of citing materials as random as historical records will likely always exist. But the task does not have to be baffling. If we take the time to learn basic patterns and to understand why variations exist, we can construct our own source identifications even when EE or one of its QuickSheets is not at hand. 1. Elizabeth Shown Mills, Evidence! Citation & Analysis for the Family Historian (Baltimore: GPC, 1997). 2. If you aren't convinced of this point yet, see "It's What You Don't See," Ancestry Magazine 27 (May/June 2009): 34–35; archived at Google Books (http://bit.ly/2uLMrJr). This article features images of census pages from Manchester, England, 1861—showing before-and-after photo enhancement by Ancestry. What was utterly unreadable became quite readable under a combination of infrared, ultraviolet, fluorescent, and incandescent lighting and a skillfully modified camera. 3. For a tutorial on how to handle the source-of-our-source element of a citation, see "The Source of the Source, of Course, of Course," blog posting, Evidence Explained: Historical Analysis, Citation & Source Usage (https://www.evidenceexplained.com/quicktips/source-source-course-course : posted 6 March 2015). 4. Abstracts in a notetaking context, are a condensed version of a record, preserving all important details in original sequence. An abstract may contain verbatim extracts from the record, in which case those exactly copied words are placed in quotation marks. 5. Extracts are portions of text quoted verbatim out of a record; they always should be enclosed in quotation marks when integrated into an abstract or other piece of writing. (Most online databases will extract data without quotation marks.) Unlike a transcript, an extract does not represent the complete record; but it is more precise than an abstract. For a tutorial on the differences between various other types of derivatives and research notes, see "QuickLesson 10: Original Records, Image Copies, and Derivatives," Evidence Explained (https://www.evidenceexplained.com/content/quicklesson-10-original-records-image-copies-and-derivatives : posted 28 July 2012). 6. The digital world (particularly within institutions) has developed a number of "persistent identifiers" other than ARKs (Archival Resource Keys) and PALs (Persistent Archival Locators). We also find DOIs (Digital Object Identifiers), PURLs (Persistent Uniform Resource Locators), URNS (Uniform Resource Names), XRIs (Extensible Resource Identifiers), and the Handle System. This QuickLesson focuses on the two systems used by the largest providers of digitized historical records. 7. Amid changeovers of this type, researchers immediately wonder whether they need to go back through their own research databases or notes to revise each citation that is affected. FamilySearch at this point reports that the PAL links will remain "permanently" operable. 8. EE user Robert Laurens offers other suggestions for parsing and shortening these long Ancestry URLs; see his responses to the thread "Using Permalinks in Citations," begun by K Britanik in EE's Citation Issues Forum, under dates of 9–13 March and 20 April 2017.